Is it even possible that 32 years have passed since this picture was taken? An old friend sent it to me in a Christmas card; precious memory. This was 7 months before we got married. 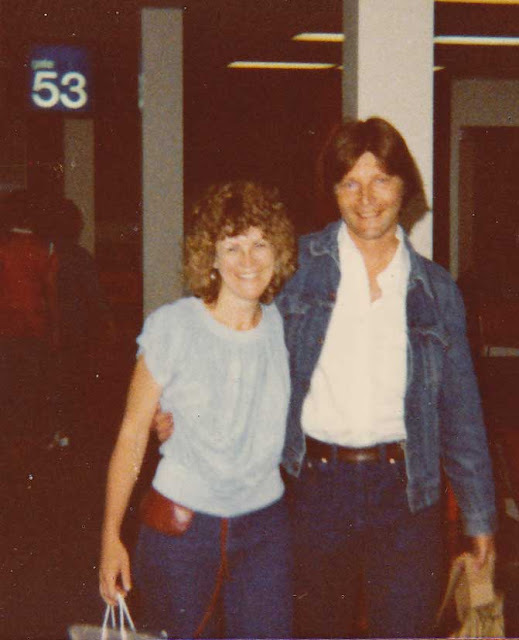 Here we are in the first blush of passionate love; I'd just returned from 2 weeks in Japan and John is a week or two away from a job on a tuna boat that would keep us separated for another 5 months. Hey, if you've never had an afro you probably weren't around in the 70's. ha ha. beautiful, sweet and happy couple! i did have an afro, but mine was in the 80's. What a beautiful photo of true and lasting love! You both look as happy today as you did then! So much love seeping out of those smiles. Happy 32 years! What a sweet picture - young love! Oh yes, I had the afro only mine was also a mullet - LOL! dan and i have a photo like this except my hair was always straight and he still had hair. 41 years and still alive to talk about it ..
What a great looking couple you are, fabulous photo. I had a hair style just like that only mine was black. Oh yesss.... I was around in the seventies! No afro though - I wore long hair with a bright coloured woven hairband - you know how that looks like don't you? Teehee.... wat a precious and beautiful photo Judy! What a wonderful photo! yes time does pass quickly so enjoy every moment you have together! you never know! Happy , healthy 2012! now that is one good looking couple...then and now! What a great photo Judy..its always incredible looking back at our younger selves..oh the things we could tell them! I missed out on the afro but had a very sweet french braid topped with a mullet when I got married! True bliss...a wonderful couple then, and now. Doesn't get better than that! As for the "fro", yep, I had one in 1976. Even though I have naturally curly, thick hair, it wasn't big & bad enough, so I got a tight perm and had a fro to end all fros! Enormous! Loved every frizzy second of it. Oh my dear friend, how sweet the picture! I had the 80's fro and still shudder when I see photos from that time. Happy 32 Judy....your such a lovely couple! Happy Sweet Beautiful, the two of you! 32 years! what a wonderful gift your friend gave you! LOVE! That must have been hard, having John leave for work on a tuna boat. Yes, had the afro, but in the 80's. Not that I wasn't old enough in the 70's, but I do everything late! (Ha Ha!) Your photo brings back memories. Thanks for sharing! Oh yes! The smell of perm solutions are back there in my memories too. Those were the days! Happy 32 years!!! You look adorable! I love it. Nothing like a fro and bell bottoms to make my day complete. One in love and thought. I think you even look alike in this photo. Congratulations on a long and loving life together my dear friend.